The Physics Groupie Blog: U.S. Politics - Galileo Revisited? U.S. Politics - Galileo Revisited? Now that all the hoopla surrounding the 2012 presidential election is over, maybe the scientific community can rest for another 4 years with the presumed assurance that science budgets aren’t in jeopardy by bastions of science deniers and other flat-worlders. But longer term is there cause for worry? To answer that question, let’s see who the GOP may have in mind for 2016. I think the demographics of our recent election have proven just how much the country has changed in terms of racial makeup and thus voter participation. Republicans will wisely consider a Hispanic candidate, and their current golden boy is Sen. Marco Rubio, R-Fla. What do we know about Rubio’s views on science? [ Beware, what I’m about to report is not for the faint of heart]. It may have been a mystery back in the 17th century, when Archbishop James Ussher calculated from the age of the patriarchs and other sources that the earth was created on Oct. 22, 4004 B.C. Today’s best estimate for the aged of the earth, based on radiometric dating or meteorites, is 4.54 billion years. The real mystery is how a highly visible politician got himself into the position of suggesting that the two estimates are of equal value, or that theologians are still the best interpreters of the physical world. 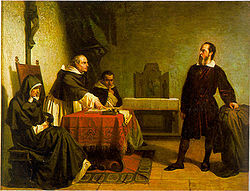 Has there been no progress since Galileo was tried by the Inquisition, found "vehemently suspect of heresy", forced to recant, and spend the rest of his life under house arrest?